Often considered a pedestrian’s paradise, La Mesa, California embraces the culture of taking to the streets and following your feet. While a majority of the city’s well-loved attractions are accessible on foot, those making the 20-minute drive from San Diego or needing safe and efficient group travel should invest in private transportation from San Diego Charter Bus Company. No matter the events you have in store or how many people are tagging along, we will simplify your La Mesa trips. Call 619-209-7804 to learn more! We understand that no two group trips are the same. 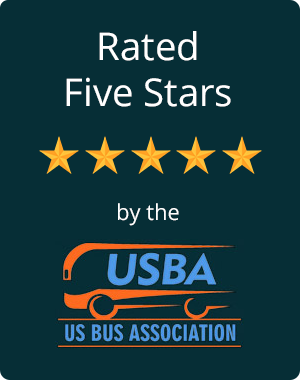 That’s why we tailor each motorcoach rental to best suit each client and type of trip, from vehicle size to amenity packages. For example, those travelling in small groups should consider booking a minibus. Its compact size and ability to comfortably seat up to 25 passengers makes it the perfect ride for short rides across town. For long-distance trips or groups with higher headcounts, we recommend booking a full-sized charter bus to service your events and travels. With plush seating and plenty of elbow room, your passengers are guaranteed a comfortable ride to any destination on your itinerary. Even better, many of the La Mesa charter buses in our network include premium amenities, so everyone arrives refreshed and ready to explore. Your passengers can sit back in reclining seats, watch a film on the flatscreen televisions, stay connected with onboard WiFi, or watch the blistering Southern California landscape roll by from the comfort of their climate-controlled cabin. Planning your next team outing in the La Mesa area? We can help! Whether you’re coordinating a coaches luncheon in town, a tailgating party for your next game day, or going for the gold at your next away game, San Diego Charter Bus Company can make getting there a breeze. Many of the motorcoaches in our network come with spacious luggage bays to equipment and coolers. Let your players to ride comfortably in plush, reclining seats and stretch out with the extra legroom a charter bus provides. No matter where your travels take you, you can rely on us to handle your sports transportation so you can get your head in the game. Outdoor enthusiasts will delight in the area’s gorgeous scenery and hiking opportunities. Whether you plan to catch the sun rise across El Cajon from the top of Mt. Helix or explore the shoreline trails at Lake Murray, a private charter bus will ensure your group has enough room to store your gear and a picnic lunch. If sips and brews are more your style, be sure to check out the nearby wineries, breweries, and tasting rooms. Southern California is a mecca for craft artisans and vineyard savants, and La Mesa is no exception; your group will want to set aside plenty of time to explore the local flavors. Rather than waiting until you arrive at the vineyard to assign a designated driver, plan ahead and book a private wine and brewery tour through San Diego Charter Bus Company. Let an experienced professional take the wheel and rest assured that everyone has a safe and reliable ride home. No trip to La Mesa is complete without a pilgrimage to the unique attractions that give this city character. For the full experience, check out the murals along the Walkway of the Stars— a pedestrian pathway turned into an urban park in the center of downtown— and climb the daunting 245-step set of Secret Stairs to one of the best overlooks within city limits. When you work with San Diego Charter Bus Company, you can even establish a hop-on-hop-off shuttle service that caters to your group’s interests, operates on a schedule you create, and lets everyone explore at your own pace. Let San Diego Charter Bus Company take care of all your transportation needs. With the travel plans handled beforehand, you and your group can make the most of your trip in and around La Mesa! Our team is available around the clock to answer your transportation-related questions when you call 619-209-7804 today. We can offer you a free, personalized quote in as little as 2 hours, so act now!